Over the summer I went to North Uist in the Outer Hebrides and spent a week at the University of the Highlands and Islands on a Summer School called ‘Art and Archaeology’. During the week we visited several archaeological sites and discussed our thoughts about what we saw. The experience has definitely influenced my work. As mosaic materials tend not to travel too well (mostly because they are heavy and quite fragile if you want to move them) I decided that I would work in a different medium. One of our tasks had been to visit the site of a 12th Century Church and to describe one part of it in great detail. I photographed and measured a wall. The work I produced focused on the wall. I drew the wall to scale, painting the stones one by one. I couldn’t work out why I didn’t like it, and then I realised that I had to fill in the render between the stones to pull it all together. This is what I do when I grout a mosaic. Subconsciously I chose something to work on that had elements of a mosaic as I knew I would find a way of interpreting it. This morning’s Mosaic Doodles, based on the thoughts I had after Joanna’s workshop. 8cm x 8cm. I am using these to work out what material to use on a 3D piece I want to make. As usual with Mosaic, the edges are the most delicate. I am very interested in making a 3D mosaic from scratch as so far I have always covered small, ready made objects such as plant pots, for example. One of my favourite sources of news about mosaic is Miriam Bastisch’s blog MUSED Today she mentions the work of an artist called Reiner Seliger. I am particularly interested to see his work as he has some 3D work that he has covered with chalk blocks. A really different use of materials. I like the sculptures he creates which I think sit well in their natural surroundings. They remind me of kilns and I like the idea that they are kilns made out of bricks. I wonder if they are hollow, or if he uses a base? He doesn’t use a very wide colour palette, which I also find interesting, even in his small, 2D works. I teach a weekly mosaic class in the Crypt of St John on Bethnal Green. Every couple of years once we have an exhibition of all our work in the Belfry of the church, which is one of the galleries that takes part in the First Thursdays Art Trail organised by the Whitechapel Gallery. My students are quite shy about exhibiting their work. I really don’t know why. 8th November 2016: WOT, NO MOSAIC? This morning’s seminar produced some really interesting ideas about how to approach our research for the R&I module. Some people have been complaining that they have too much information to read: I have the opposite. Initial research efforts drew a blank and I have widened my search to ‘contemporary craft’ ‘mosaics’. I have now read a lot of interesting material that has given me a broad base from which to start. The most startling fact about the information I have read is the absence of any reference to Mosaic Making in the literature. Why is this? Even Glenn Adamson’s ‘The Invention of Craft’ which was written while he was Head of Research at the V&A (which spearheaded the revived interest in Mosaics in Britain in the nineteenth century and used to be the home of a noted Mosaic School) does not refer to Mosaics or mosaic making in his work. Mosaics occasionally feature in major exhibitions as part of a wider show,. 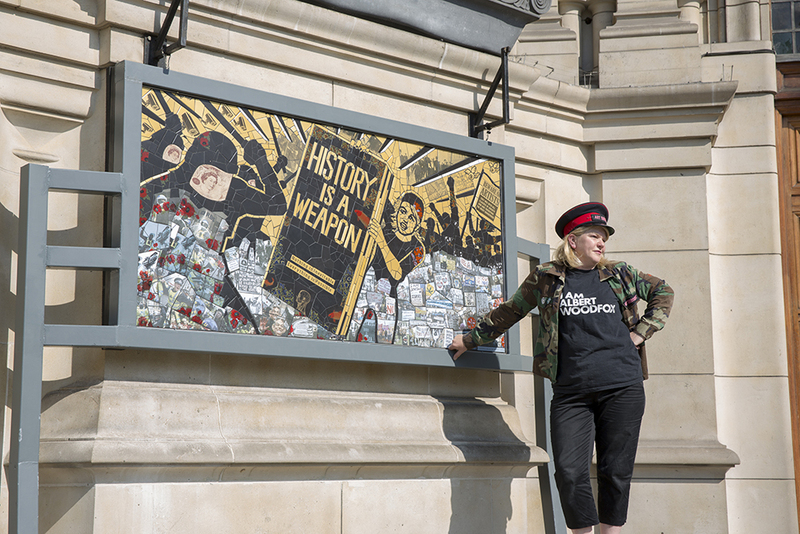 In 2014 the V&A held Disobedient Objects which featured Carrie Reichardt’s pick up truck decorated with mosaic, and she staged ‘A Ceramic Intervention’ (according to the V&A) on the outside of the building itself. Call it what you like, but it looked a lot like Mosaic to me! No research is ever wasted, and my findings encourage me to read more and to fill in the gaps of my knowledge. A bit like grouting, perhaps…..
Coming up the escalator at Bethnal Green underground yesterday, I saw a poster advertising a piece of art that I have long been curious about. It is called Wrapper and is by Jacqueline Poncelet. It wraps Edgware Road Underground station and can be seen from the Marylebone flyover. I love it because to me it looks like a sampler of different ideas and thoughts that the artist has had and put into her artistic medium, much as in the same way an embroiderer would make a sampler. Reading about it, Poncelet has drawn on the locality for her inspiration. It feels to me that she has gone much wider and that it is a homage to ceramic tiles from many different places. Things you don’t expect to see in the landscape. While waiting for the paint to dry on my wall painting (see previous post) I took great pleasure in doing some yarn bombing. This was triggered by the fact that there are so many sheep in the Outer Hebrides, and the strange need to cover a rock with wool with the thought of seeing how it looks back in the landscape. I think it looks at home. More so than these, perhaps…..
……at Gwennap Head, at the Coastal Watch Centre, South Cornwall. These are to stop boats running aground. Coming across them from the coastal path, one could be forgiven that something had just landed…. I’ve been reading A LOT about Art, Craft and Mosaics. I have been reading Mosaic blogs as already mentioned, and publications such as Andamento ( published by BAMM), Mosaic Art Now and MosaÏque. Until this week I felt that although interesting, I didn’t feel that it was terribly relevant to my work. A chance conversation with my tutor about something I had seen in an exhibition catalogue has changed all that. Then I started reading about Boody Ware. Oh yes. This is the use of broken crockery to make a pattern on another surface. It predates the Arts and Crafts movement by at least fifty years and was popular among the working class in the North East of England. I would like to go so far as to say that it probably dates back earlier than this, as I know from experience that people don’t like to throw things away! This example was included in the Tate Britain exhibition of British Folk Art in 2014. Study in Brown, Alex McHallam, 2013. 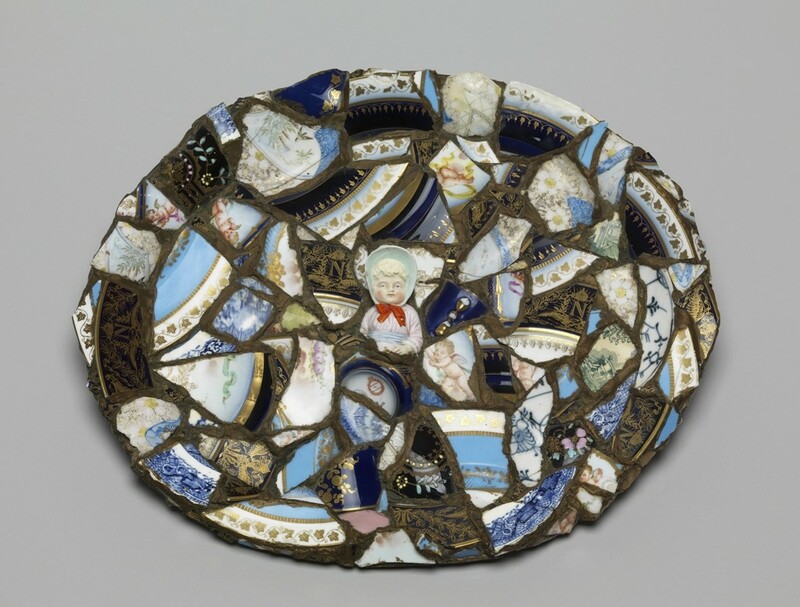 This is one of my pieces, from 2013, made with found objects from the Thames, a mixture of crockery, some of it as early as 1680, with clay pipes, also from the river, and a selection of contemporary glass and unglazed ceramic tiles. Further research has led me to look again at the work of Cleo Mussi. She is a contemporary British Mosaic artist with a distinctive, figurative style of mosaic which she makes exclusively with found ceramic. Her exhibition earlier this year was called Cleo Mussi: Boody Ware. It feels that a piece of the puzzle has fallen into place. Today I attended the annual conference of the Association for the Study and Preservation of Roman Mosaics (ASPROM ). Over lunch I took the opportunity to ask Chris Smith, a prominent Mosaic artist and an expert in the area of conservation of Roman Mosaics why Mosaic making appears to have ground to a halt in Britain once the Romans left. He told me that it was a question of distance and economics. As an outpost of the Empire, it was always expensive to get a Mosaic made in Roman Britain as the craftsmen had to travel to do the work ( though usually they used local materials). If local help was required on the project, they were usually slaves. Therefore there were very few home grown Mosaic artists and no local craft tradition, unlike in Italy, for example, where there were (and still are) generations of families working as mosaic makers. It became too costly to get mosaics made, with the exception of extremely special buildings like the Cosmati Pavement in Westminster Abbey that dates from 1245. I spent today in the studio of a friend of mine, Liz Tiranti, who makes the most amazing 3D mosaics. She has her studio in her garden in Hove and she let me help her while telling me how she makes her 3D shapes. First you get your polysytrene blocks. You shape them using a hot knife and a wire brush. You then cut the shape in half to make a channel to insert a stablizing rod 2/3rds of the way up, that can be inserted in a base. You then stick it back together with gorilla glue. At this point you can add other components to the design, using steel pins and gorilla glue. Then you cover the whole thing with plasterer’s mesh and cover this with a thinset of cement based adhesive. You leave it to dry. Then you cover with another layer of thinset, this time with fibreglass fibres added. You leave it to dry again. This takes two days. Then you can start to mosaic the shape. Here’s one she started earlier…. As they say, Rome wasn’t mosaicked in a day…. I have been rereading the material I read over the summer around Art and Archaeology and in particular, about Mark Dion and his Thames Dig. I love mudlarking. I always go to the river at Wapping because I love the view of Tower Bridge from there. Being on the foreshore makes me feel as if I’m in a secret part of the city. Often it takes a few minutes for one’s eye to adjust to looking in detail at the sand. I have also been reading Ted Sandling’s excellent book ‘London in Fragments, a Mudlark’s treasures’ which has beautiful photos of his finds with accompanying notes of their origins. My favourite find is a clay pipe I found in 2015. I sent it to Ted’s Facebook page London Mudlarks and received some background on it. Apparently it was made 300 years ago to commemorate the union of Scotland and England – hence the thistles and roses. It was found in the year of the Scottish Referendum by a Londoner with a Scottish father….. I really like the idea of doing a site specific piece of work, using the objects I find there. One of my most favourite mosaic exhibitions was Emma Biggs and Matthew Collings Five Sisters in York in 2009. The work was made in response to the Five Sisters stained glass window in York Minster and comprised of hundreds of medieval pottery shards that had been found on archaeological digs in the city. None of them were stuck down as they all had to be labeled and returned to the city archive afterwards. Some of the pieces had the thumb prints of the makers on them – Walter Benjamin would’ve liked that. 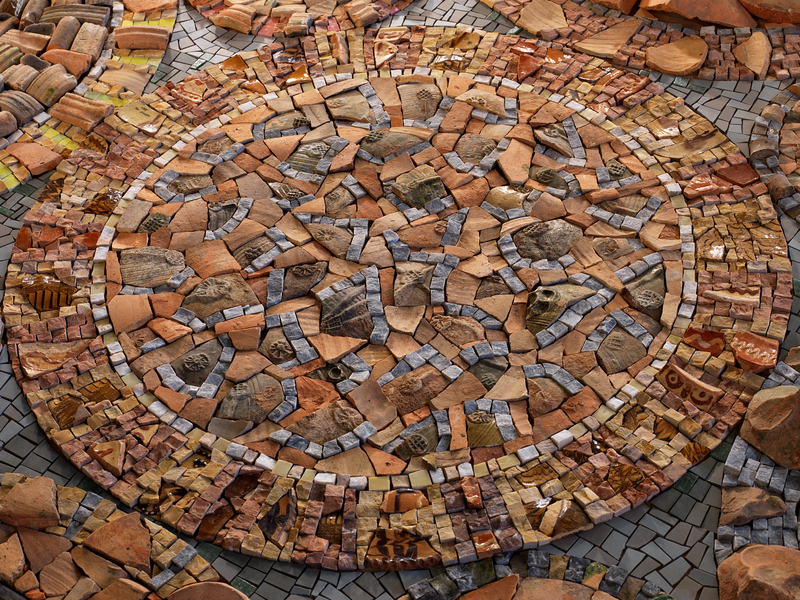 MOSAICS: PIECES OF A PUZZLE. I would by lying if I felt that all the pieces have fallen into place, but they are starting to. I now feel that my work has a definition and a history, thanks to my discovery of the wonderful term, ‘boody ware’. I wish to continue to use objects in my work and have some very strong reference points in Emma Biggs and Cleo Mussi. I also want to make a site specific piece with objects found there. What it will be made of will depend on the site! Meanwhile, I have been working in 3D on a small scale. This is Marina, named after Marina Abramovic. I was listening to an interview she gave on BBC 6 Music with Jarvis Cocker in which she said ‘that the best thing an artist could do with their artistic energy is to sit in a chair for 3 hours and do nothing.’ No chance of that, but my Marina head can do it for me! During my Work in Progress review this semester we discussed what sort of objects I would find in situ to work with on the Outer Hebrides. Someone, who shall be nameless, but should’ve known better, suggested that I should mosaic a sheep, if I could find one.